While IUI refers to the simple procedure of depositing sperm into the uterus, there are a number of crucial steps and decisions that need to be made including: which medications (if any) get taking during the cycle, whether the woman undergoes daily monitoring, how the eggs are released, and how the sperm is prepared and placed. Generally speaking, fertility clinics have greater capabilities than OBGYN offices and can offer patients a broader range of choices. In order to raise the odds of pregnancy, a woman has the opportunity to take drugs that help multiple eggs to grow and to ensure she ovulates. As we alluded to above, gonadotropins slightly improve rates of success but are expensive, and increase the risks of cycle cancelation or higher order multiples. For this reason, gonadotropins require continual monitoring, which OBGYNs can rarely do and, as a result, most OBGYNs cannot prescribe gonadotropins. Rather, letrozole and clomid have become the more popular choices as they improve rates of conception, subject the patient to lower risk of multiple births than gonadotropins do, can be taken orally, and cost little. 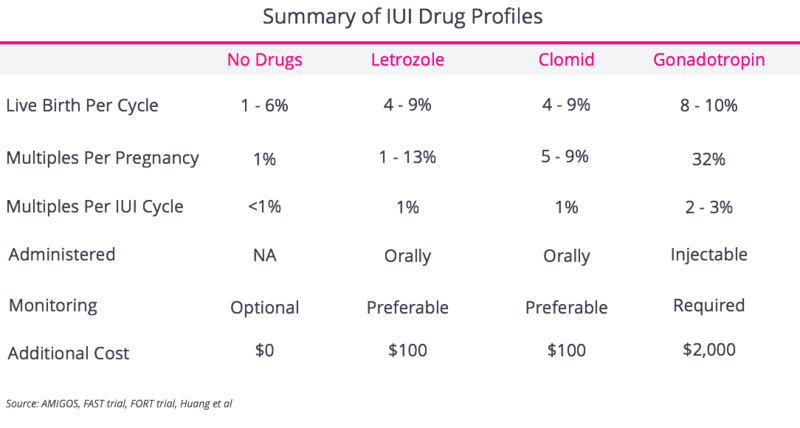 While we often lump clomid and letrozole together, the truth is they are different. Clomid has been studied more extensively but remains in a woman’s system longer. For a sub-group of patients, the distinction does matter: specifically, PCOS patients have better outcomes with letrozole. Women often have the option to have their cycle monitored and have blood work drawn, which gives valuable insight into how the cycle is progressing. This can be crucial because if the woman is not growing any follicles (fluid filled sacs that house eggs within the ovary) or is growing too many (e.g. 4 or more), dosing adjustments can be made. What’s more, blood work taken during monitoring appointments allows the doctor to predict when a woman will naturally ovulate. Eggs must be fertilized within 6 - 12 hours of fertilization, so being precise is important. Most OBGYNs do not offer monitoring appointments. Patients that do not get monitoring often have little insight as to whether the cycle is working (or is dangerously progressing with too many follicles) and must rely on ovulation predictor kits (OPKs) to indicate when ovulation has occurred (OPKs are notoriously inaccurate for some patients, namely women with PCOS). But foregoing monitoring saves money and hassle, and many women undergoing a natural, unmedicated IUI cycle opt to skip monitoring. Once a woman’s follicles have reached a certain size, they will release an egg(s) naturally, or ovulation can be catalyzed by a “trigger shot.” While each approach has its merits, neither approach has shown to be superior in terms of outcomes. The benefit to using a “trigger shot” is that it forces ovulation for a specific time, which ensures that IUI will take place at the proper time. Also, in the case that multiple follicles are growing, a trigger shot ensures that the large follicles will ovulate for insemination before the smaller follicles have a chance to grow, ovulate, and also become fertilized. This reduces the risk of a high order multiple pregnancy (meaning triplets, quadruplets, etc.). For this reason, trigger shots must be used when gonadotropins are being taken. The drawback of using a trigger shot is that the medication isn’t free (it costs $50 - $250), and it requires an injection at a very precise moment (often in the middle of the evening). Women who aren’t taking drugs are seldom required to use a trigger shot. Sperm are typically washed to remove harmful elements in the seminal fluid. There are two methodologies to do this -- “swim up” and “density gradient” -- and both are considered equally effective. Typically fertility clinics have experts (andrologists) on staff who specialize in sperm washing and preparation. There’s a good likelihood they deploy more sophisticated techniques than those used in an OBGYN office. When possible it is always better to use “fresh” sperm rather than sperm that has been frozen and thawed, as frozen sperm yield lower success rates. However, most sperm banks only provide frozen sperm, which can still be effective. The best study we’ve seen on the subject was conducted at Harvard and it does not appear to make a difference whether a nurse, fellow, or experienced doctor places the sperm in the uterus. Some wonder whether placing sperm twice, on two successive days is helpful, though this is certainly not standard. The data we have available is contradictory but, on balance, suggests the answer is “very minimally.” The only certainty here is that your clinic will make an extra $400 or so. Fertility doctors and OBGYNs offer IUI cycles, but fertility clinics are in a better position to offer daily monitoring (to track and adapt the cycle), more expertly wash sperm, execute the insemination if ovulation occurs over the weekend, and provide gonadotropins if needed. 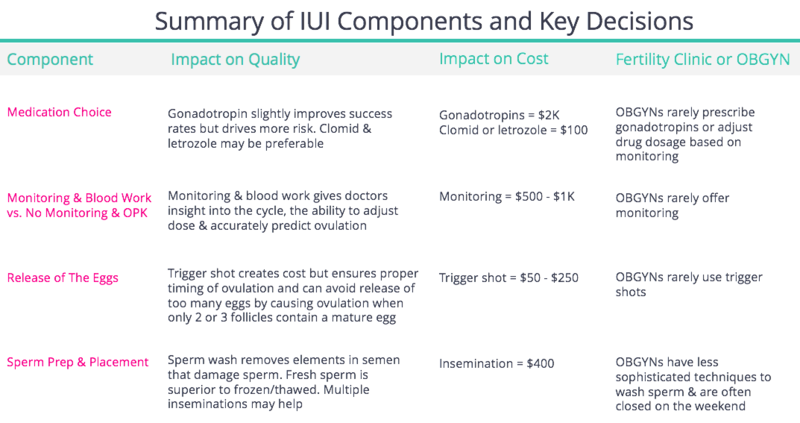 For these reasons, all things being equal, a patient is likely better off getting an IUI at a fertility clinic. That said, there are no studies comparing results between the two settings.